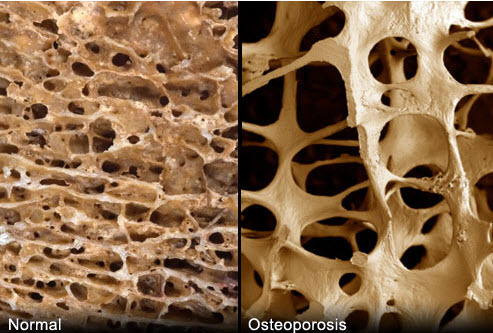 Osteoporosis means “porous bones.” Our bones are strongest at about age 30, then begin losing density. More than 10 million Americans have osteoporosis, which increases the risk of fracture. About half of women 50 and older will have an osteoporosis-related fracture in their lifetime. One symptom is back pain, caused by changes in the vertebrae. Furthermore, spinal compression fractures are the most common as they alter the shape of the spine. In addition, hip fractures can cause permanent mobility problems and even increase the risk of death. Wrist, pelvic, and other fractures are also common in people with osteoporosis. Bones are made up of collagen, a protein that provides the basic framework, and calcium phosphate, a mineral that hardens the bone. As we age, we lose more bone than we replace. The greatest change in a woman’s bone density comes in the five to seven years after menopause. Women’s bones are generally thinner than men’s and bone density rapidly declines after menopause. 80% of Americans with osteoporosis are women. Heredity plays a role, as does ethnicity. It is more common among whites and Asians, although African-Americans and Hispanics can also be at risk. Some diseases, such as type 1 diabetes, rheumatoid arthritis, inflammatory bowel disease, and hormonal disorders are also linked to bone loss. Smoking, a couch potato lifestyle, and a diet low in calcium and vitamin D will put you at greater risk for osteoporosis. Moreover, excessive drinking may also lead to bone loss and fractures. In addition, corticosteroids and anti-inflammatory drugs will also increase your risk of bone loss. Finally, eating disorders such as anorexia nervosa and bulimia can trigger the disease. It is much more common in women than men. In fact, only about 25% of men over 50 will have an osteoporosis-related fracture. As your bone density decreases, your T-score gets lower. Biophosphonate class drugs are usually prescribed, taken orally, such as Actonel, Boniva, Fosamax, or Reclast. They can reduce bone loss and fracture risk and may actually build bone density. However, there are serious side effects such as ulcers, acid reflux, and nausea. In addition, injections may cause the flu, jaw bone destruction, and femur fractures. Hormone replacement therapy comes with serious side effects such as cancer, risk of cancer, blood clots, heart disease, and stroke. Moreover, leg cramps and dizziness have also been reported. All treatments, such as drugs or hormones will have serious side effects. One treatment that is safe, is to eat healthy and nutritious foods that contain calcium and magnesium. You should drink three and a half 8-ounce glasses of milk each day. Also, eat salmon, tuna, and herring which contain vitamin D and omega-3. Leafy green vegetables provide magnesium, and also helps to maintain good bone quality. Minimize calcium deficiency by avoiding canned soups and processed meats. Control your sodium intake to a maximum of 1500 milligrams per day. Most Americans get much more sodium than they need. Stay away from caffeine as it decreases your body’s absorption of calcium, if you drink more than three cups of coffee a day. In addition, drinking excessive amounts of alcohol will also result in bone loss. Weight-bearing exercise can help you build bone and maintain it. That includes walking, jogging, tennis, and other activities where you move the full weight of your body. Using small weights in many different activities helps bones. Women who walk just a mile a day have four to seven more years of bone reserve. Many people don’t find out about their bone loss until they are in their 60s or older. Be proactive right now by exercising regularly and eating a healthy diet that is rich in calcium and magnesium.